Note: August 2002. These Library pages need an update. The new process is even simpler and more convenient. Getting primary literature without leaving your computer. Help from the UAF library. Most of the primary literature and secondary literature, except government documents, is not available from the www. Those journals are sold to libraries at a steep price. We are fortunate in Alaska and UAF that our library has the ability to get articles to you from several sources. The Rasmuson Library is committed to serving distant students and has an interlibrary loan department that is quite helpful. They can get photocopies or electronic copies of journal articles, relatively quickly. They will find entire books too, although that takes a little longer. You start this process by going to the library http://www.uaf.edu/library/ Look at the second main heading, Online Information Resources, there the first three bullets are your gateway. Now if you are on a UAF computer, the library's computer recognizes this and gives you access to almost all of those resources. However, if you are not on a UAF computer, the library's computer knows that too, and when you get to some of those resources, you will be stopped for a user id and password. So you need to get these. It is usually a very fast operation, weekdays. Just send a brief Email to fyref@uaf.edu and tell them you are enrolled in ENVE 649 at UAF and need a password. They will get back to you, usually the same or next workday, and you are in business. Next you want to search for articles. Here's how to both search for these articles and how to get them without leaving your computer. Go OCLC first search, its the second resource on that webpage. OCLC is a search engine of databases of the primary literature. You will have to go there and learn about it yourself; it has both an Intro and Help button, start with intro. If you get a login screen, put in the login code and password (see above). OCLC will search one or several enormous databases and return lists of articles that match your search terms. For each article you'll find the title, authors, journal information etc. For most databases, unfortunately, there is no abstract of the article. For others there is an abstract, and for a few the entire article is available electronically, directly from OCLC. If you find an article that you need, OCLC will tell you which UAF libraries have the journal the article is in (caution, it only knows if the journal is currently carried by the library, not actually if the particular volume with your article is in the library.) If the article is not in the UAF libraries, you can order the article directly from Interlibrary Loan (ILL), just select the article and click the ILL button on the top. Please choose Distance Delivery Services as your pickup library. You will need a "Library id" which is sometimes called a "gnosis number." I'll tell you below how to get that below. A more useful search engine that does return abstracts is CSA. From the library page, Elmer Rasmuson Library, below Online Information Sources (where OCLC was) to Alphabetical List of Online Resources find Cambridge Scientific Abstracts. You may start searching using CSA or you may use CSA to find an abstract from the title and other data you found in OCLC. Often the abstract will tell you all you need to know about the paper and save you and ILL staff time, if you don't need the whole paper. CSA also has Interlibrary Loan requesting enabled within the databases, under "Get/Locate Item." Please choose Rasmuson Library as your location and indicate that you need Distance Delivery Services in the notes field. Unfortunately, CSA only works for computers with a UAF IP address, so it is not accessible from outside computers. If you are off-campus and locate a likely title on OCLC, but can't find an abstract, you have another option. Just take the title and put it into a web search engine, like Alta Vista. You can try that with the authors' names too. Often the journals that published the articles put the abstracts on the web. For primary data about toxicology, you can use Toxline which you access through Toxnet http://toxnet.nlm.nih.gov/ . (There's lot of other neat stuff on toxnet.) Toxline will give you an abstract. Toxline is available to anyone from the Internet. 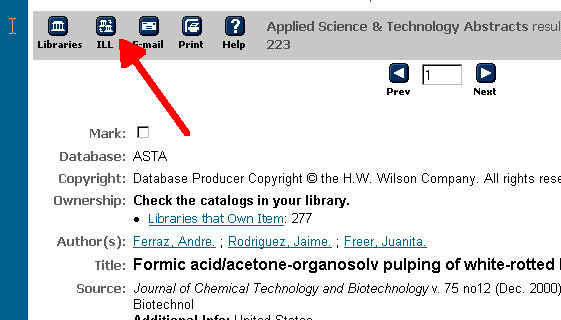 Next you need to find out if a copy of the journal that has the article is in the UAF library. If OCLC tells you the journal is not at UAF, you can order it from ILL direclty through OCLC or CSA. If you learn of an article outside of OCLC or CSA, you can order it through the ILL website: http://www.uaf.alaska.edu/library/libweb/services/ill/index.html from which you can follow the links to submit your request. Please choose Rasmuson as your pickup library and indicate that you need Distance Delivery Services in the notes field. If you don't have a UAF library or Polar Express card, you must first contact Off-Campus Services at fyddl@uaf.edu or 1-800-478-5348 to get a library card or "gnosis" number. You will need that in your ILL requests.If the article is in our library and you live in the Fairbanks NS Borough, you have to come to the library, read and/or copy the article yourself. If you live outside the Fairbanks area and locate a journal article that is in the library, you should Email the Off-Campus Services and let them know. They will probably scan the article and send it to you electronically. Determining if the journal you want is in the UAF library, you can search via gnosis, the electronic catalog. There is a link to gnosis on the library's page http://www.uaf.edu/library/ under Catalogs. Gnosis has a help menu. But for example, if you want to learn if the journal American Heritage, is in the library, you just type t/american heritage. If the author you know is Perkins, R. you type a/perkins, r. An so on.